As is often the case with nostalgic comments, this joke plays on a misperception – an anachronistic perspective – about what Chavismo was and what it really stood for. For the fact is that rather than being rich or better off what the Bolivarian Process really offered people in its best moment was dignity. But that was known: people were quite conscious of it! So the joke about once “having been rich” only works because it touches upon and reenacts the now widespread tendency to trade material well-being for dignity as an ideal and reinterpret the Chavista past accordingly. Another question that turns on the complex relation of the present to the past is how to fix the grave problems that Chavismo faces today: how to connect the movement with its more revolutionary recent past. Like the situation of Sandinismo in Nicaragua, present-day Chavismo seems like a sphinx posing a question for intellectuals. How far can you bend the stick of “progressivism” to the right before it loses its original character? Of course, just as with the original Greek sphinx’s riddle, the correct answer to this one points back to the very subject to whom it is posed. That is because the intellectuals who have accompanied these processes – with our attitudes, limits and inclinations – are not separable from the way they have developed. We have played a role, even if largely a passive one, in the movements’ current derive. Hence, in a dialectical way, we are called upon to interrogate, not just on an abstract level but also on a concrete one, how there could be a real rectification of the movements in which we participate. How did we get here? And how could we get back to the once revolutionary condition in which ideals such as dignity mattered more than mere material goods – that is, when we were much more left-leaning and dignified and did know it? The first question is a methodological one. Many people on the Left think that the way to go about making a revolutionary transformation is that, first, you or your group sets about conceiving the main points of its program. Then you try to persuade people to subscribe to these points, forming an ever-expanding movement. It’s as simple and straightforward as that. But this is actually a false (essentially Enlightenment-informed) view of things. In part, its falsity lies in suggesting that thought is something merely subjective and internal. Thought is seen as a complex process which happens inside the head (perhaps as a set of neural processes or brain states), and then it is shared to become “intersubjective.” Conversely, in this view the outward world is understood to be something merely objective and thought-free: it is the lifeless order of things. Now Walter Benjamin, who was a great critic of reformism, saw things from a different perspective. In “Convolute K” of the Passagenwerk, there is a reflection that is key to Benjamin’s whole work and completely belies the view of him as an individualistic homme de lettres. Following some reflections on psychoanalysis, dreaming and sleep, Benjamin writes “much that is external to the individual is internal to the collective.” What this means is that the collective’s (“internal”) ideas, dreams, and projects are to be found in the individual’s (“external”) world – in its architecture, for example. That, of course, is why Benjamin had the apparently Quixotic idea of finding the “subjective” impulse and motivation for the contemporary revolution in the phantasmagoric world and collective dreams expressed in the Paris arcades. Some of this certainly appears to be a bit utopian and far fetched, but the idea of finding the revolutionary impulse outside of oneself as a material force is much less utopian (almost by definition if one is thinking about socialism!) than wagering on a project which begins inside of one’s head. Now if we jump to Latin America and the case of the young Hugo Chávez, we see that he thought along similar lines as Benjamin. He, too, felt that the collective revolutionary dream was to be found in the external world. That is why the young Chávez, before he became a public figure, tried to locate the impulse to the Venezuelan revolution by hunting down the footprints of “Maisanta” (Pedro Pérez Delgado), an early twentieth-century guerrillero who happened to be his great grandfather. These lines of Marx are famous, but too often the mention of arms in this same passage (“the criticism of arms,” etc.) has led readers away from the main point, which is that reality and matter must strive toward thought, if we are to have a revolution. A presupposition to Marx’s claim here is that there must exist potential thought – potential revolutionary thought – in the material and real environment. That is what both Benjamin and Chávez believed. If for Benjamin, revolutionary potential was to be found in the memory-labyrinth of the arcades, for Chávez it was in the living tradition of Maisanta and later Bolivar and others of the so‐called Tree with the Three Roots. That was the reality, the material force, which was striving toward thought. It is in the engagement with such forces that revolutionary politics lies. There is no revolution to be found – and the history of reformism demonstrates this very clearly – in reality as something merely objective, on the one hand, or in thought as a merely subjective phenomenon, on the other. Revolutionary politics is to be found when we discover and incite an element of objective reality striving toward thought. It might be called “Bolivar” in Venezuela, just as it could have to do with the Parisian built environment in an another context. Now, this methodological perspective has an important bearing on the post-Chávez present in Venezuela too. Today, technocratic sectors of the Bolivarian Process believe that the way out of our crisis – “la salida” – is simply to conceive what is needed and do it! In the worst version of this approach, even anti-Chavistas like Carlos Vargas (who oversaw the Petro cryptocurrency project) are seen as having something to teach us. Bright young people from either camp should join hands! We should just think about what needs to be done and go from there! Similarly, the socialdemocratic tendency shows an excessive focus on questions of macroeconomic policy, which are surely important but neither the starting point nor the framework for recovering the revolutionary character of the Bolivarian process. Both are versions of (the Enlightenment) idea of dividing the world into what is given (objective) and what needs to be done (subjective). They are not revolutionary at all. By contrast, most of the serious and engaged Left in Venezuela understands that the success of the project depends on finding a revolutionary possibility that is latent in actually-existing Chavismo and activating it. This would be a suppressed tendency pointing toward a different-possible-future-for-Chavismo than the actual one. Where could one find this missed possibility: this other road that was not pursued at an important historical bifurcation? Now, many people understand that Chavism was always a mixed affair, incorporating different layers or tendencies. The movement was clearly drawn in two or more directions, often at the same time. This complex dynamic is seen most clearly in the way that, after 2007, a bureaucratic involution in vast sectors of Chavismo was accompanied by theoretical developments pointing in the opposite direction: toward a substantive democracy. Beginning around 2010, Chávez himself speculated very rigorously about communal forms that would implement a democratic control of the production process. Yet, although this tendency came alive in some small and isolated experiments, it was never the dominant one in the movement. With Chávez’s death the aspiration to substantive democracy was definitely pushed to the background. As a result of the power struggle among the surviving leadership and the local ramifications of the global economic crisis, the communal project became subaltern. This is what leaves Venezuela’s revolutionary left – the one that realizes that the revolution depends on reality striving towards thought – with the urgent task of figuring out how to activate this latent revolutionary reality that was passed over by the dominant, bureaucratic tendency. The profound crisis of the twenty-first-century Latin American political processes, in which Venezuela has played a key role, has led some analysts to doubt if there is a Left anymore in certain contexts or to declare the end of a cycle of “progressive” governments. In fact, a whole body of writing and opinion has rapidly emerged that speculates, in a strange but surely symptomatic manner, about the end of the “progressive” cycle. This kind of thesis is obviously problematic because of its hastiness, but it also needs refinement to either substantiate or refute its claims. What do we mean by “Left” in the political sense? If we argue, following Norberto Bobbio, that the essential feature of the Left is that it defends equality and add that the socialist left defends substantive equality, then the thesis of the Left’s disappearance relates directly to the situation described above. The socialist left tendency – the one seeking substantive equality through communal and collective control of production – is now repressed but latent in the Bolivarian process. It has not exactly disappeared. In today’s Venezuela, important sectors of the Left are aware of this complex dynamic. 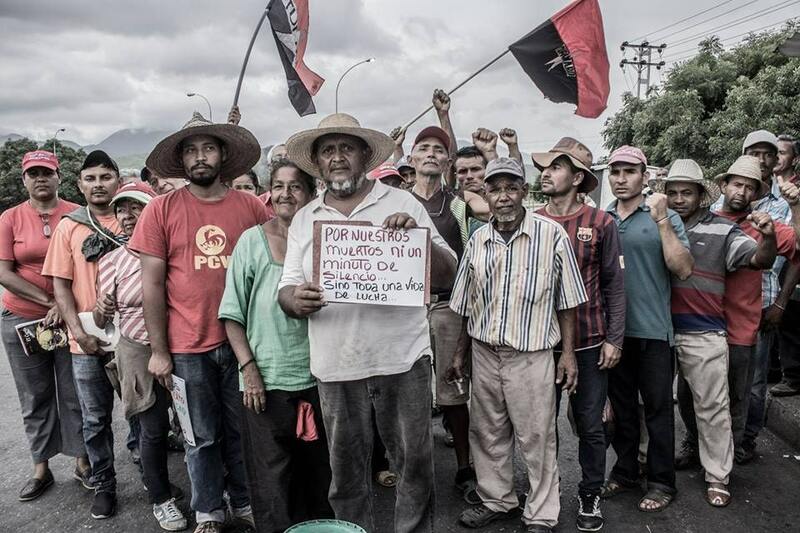 The series of “Chávez Radical” videos, produced by Tatuy TV, points in this direction as do the now quite visible struggles between comunero Chavismo and the bureaucratic variety in such places as El Maizal commune and in the recent Admirable Campesino March. In the struggle of these groups, the revolutionary reencounter between the subject and object is proposed in the most concrete and meaningful terms through the comuneros’ reappropriation of their labor conditions.